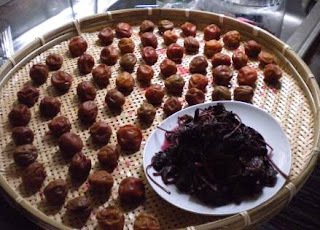 I put the umeboshi and the accompanying shiso leaves out to dry today at long last. They turned a beautiful pink color after sitting in their ruby red brine. The outside feels lighter and dryer since I set them out this morning, and I'm curious to see how they continue to change as they progress. I simply fished them out of the jar by hand as I wasn't sure how delicate they were, and then placed them on their baskets. 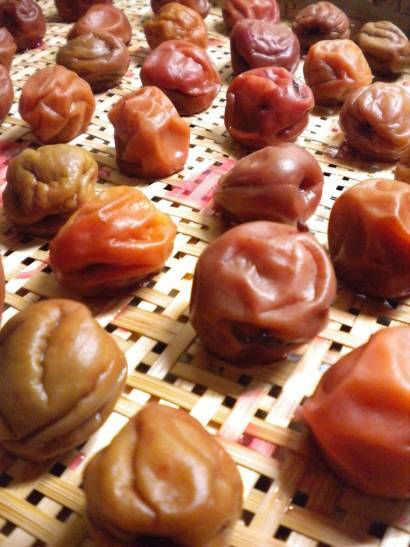 I only did up one kilogram of ume, and the baskets are jam-packed with these little wrinkled fellows. Not all of the shiso leaves would fit, so they have to wait until I can get to the store to pick up another. I don't imagine that the leaves will require quite as much time as the heavier, denser plums, but I could be wrong. We shall see. Now, on to the hachimitsu!